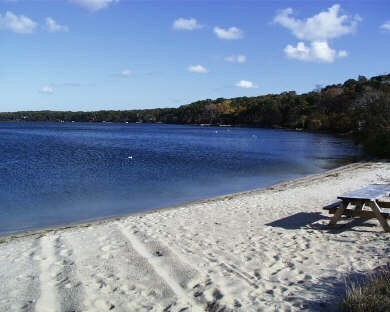 Long Pond Beach - just 1/4 mile from the house and lovely! A little 'refresh' for the living room! 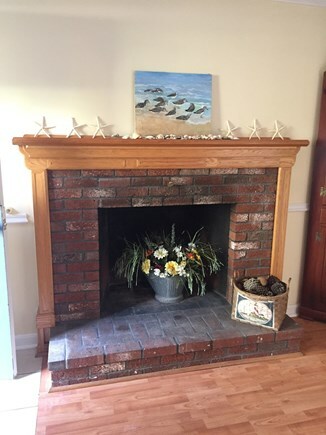 You probably won't need the fireplace during your summer stay! Nice open space for family meals. Everything you need to make a home cooked meal. Queen bedroom on the first floor. This is a great room for the kids--3 twin beds, AC unit & a TV. We've added another, larger picnic table! 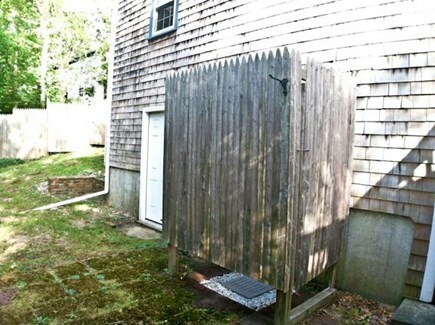 It wouldn't be the Cape without an outdoor shower! We aren't supposed to have favorites, but let's be honest - the furry ones tend to be the favorites. And it's so hard to leave them behind when we travel. If you have a dog, he/she is welcome at 33 Lakewood pending owner approval. There is an additional fee for the pet cleaning, but it's less than you would pay to board your dog for a week. 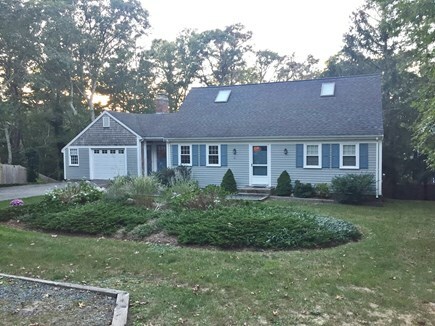 This wonderful, Cape-style home in Harwich is set in a quiet, peaceful neighborhood, yet it provides easy access to all things Cape Cod. 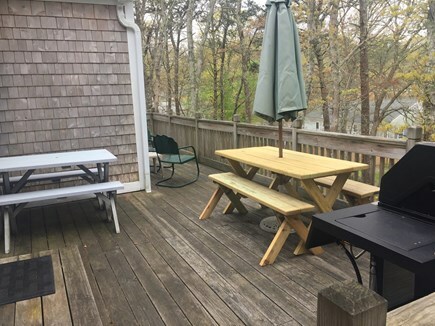 This location is just 4/10 of a mile to Long Pond (Cape Cod's biggest fresh water pond with 716 beautiful acres; offering multiple beaches, and excellent fishing and boating). It is also less than a mile to the Cape Cod Rail Trail bike path, and a short bike-ride to public tennis courts. This home is a great choice for those seeking an active vacation. There are 2 bedrooms on the main floor and 2 upstairs with a full bath on each floor. The bed configuration is nice for 2 families or one large family. 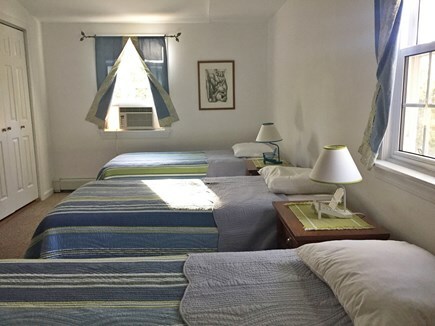 Upstairs, one bedroom has a king bed and AC, while the other has 3 twin beds and AC. 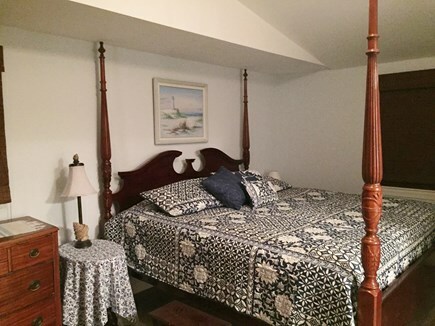 On the main floor, one bedroom has a queen bed, while the other has 2 twin beds. 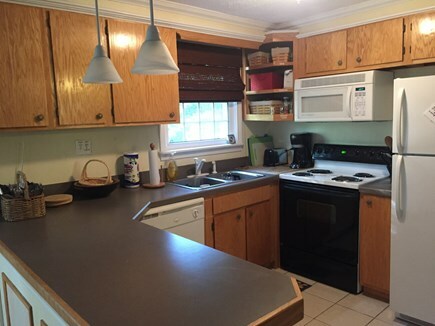 The kitchen is fully equipped including a microwave and dishwasher. 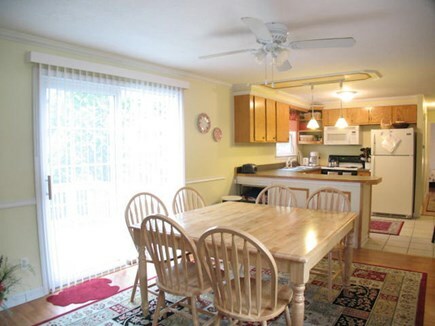 There is comfortable seating for 8 to 9 people and a ceiling fan in the dining area. The living room has a TV with DVD player. Outside, there is a spacious deck outfitted with a gas grill and outdoor furniture. Bring your boat! This yard has an area to park a 21' boat. Other amenities include an enclosed outdoor shower, washer/dryer, and WIFI Internet access. Additional pricing info: Discounts available for repeat renters and multiple week reservations. State and local taxes of 12.45% will apply. There are a couple steps from the yard into the house. 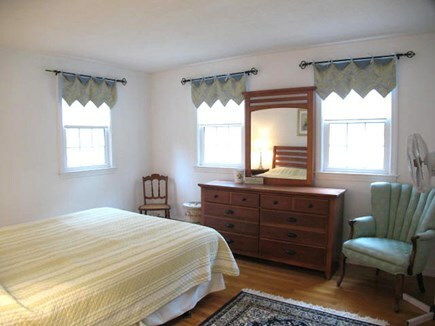 We have 2 first floor bedrooms (1-queen and 2-twin beds). 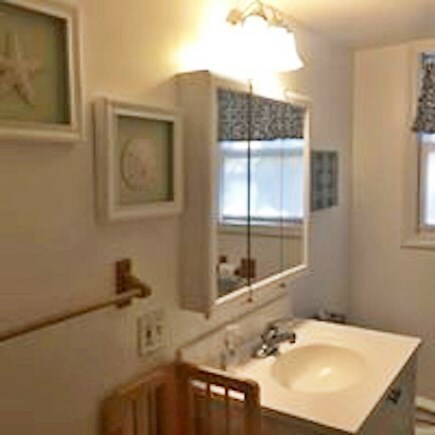 The first floor bathroom is a full bathroom, but it would be too small for a wheelchair. Call to discuss before booking. Lovely house in a perfect area! Great for large families or 2 families!! We just got back from our week on the Cape in this beautiful house!! 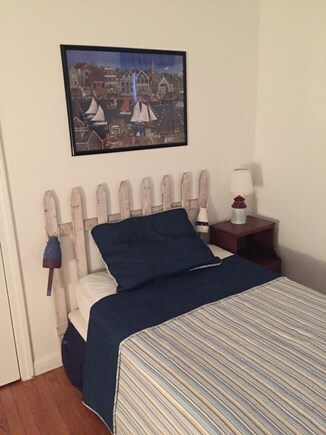 It was in an area we loved, convenient to everything (Long Pond Beach is just around the corner and the Brewster bay beaches are 6 minutes away!) and quiet! It was well appointed....had a TV in the upstairs room with 3 twin beds (perfect for a kids room), plenty of board games, card games, books, beach chairs, boogie boards, etc. The upstairs master was large with a beautiful king bed and the downstairs had 2 bedrooms as well! The living room, while. Little on the small side, was comfortable and cozy. The deck was lovely too! We just loved the house! The only thing I could say that would improve it at all would be the addition of air conditioners in the downstairs bedrooms and larger capacity air conditioners (15k BTU+) upstairs. We actually had a heat wave for the first time in years visiting the Cape, and the house was quite warm with only the 2 upstairs air conditioners. They did provide fans as well but it just wasn't enough. However, it didn't detract from our stay and we thoroughly enjoyed ourselves! Great vacation spot for large/multiple families! Another great stay at this Harwich home! 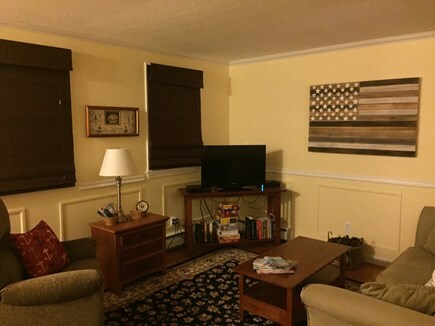 This vacation home is very comfortable and accommodating to fit our large family and our dog. Convenient to many local attractions and restaurants. Would definitely come back again! Thanks for the 5 star review! We will add a reminder re: the early morning trash pick up on Fridays. If you think of anything else we should add to our 'check in/check out' info, please let me know. We are a military family that was stationed in Newport, RI and fell in love with the Cape so we bought this wonderful home! Eventually, we'll live here, but right now you get to enjoy it! We have owned and rented the home since 2008. It has booked consistently and with repeat renters. We've decided to rent it directly rather than go through a realtor. We are looking forward to actually getting to know the people that are renting our home--we never had that opportunity when we rented through the realtor. We really believe that it's all about the relationships we make in life. We've moved 12 times in 27 years and have friends all over the world. Our hope is that we will make a few more as we share our home with you! They say it's all about 'location, location, location'. We love our location! 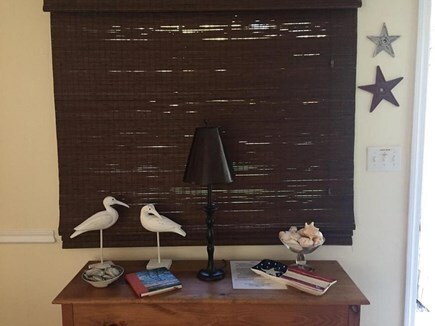 Nestled in a quiet neighborhood right off Long Pond Rd and the Mid Cape highway, our home is a pivot point for all things Cape Cod. You are minutes away from Long Pond, the bay side beaches and the ocean beaches. You can hop on the Mid Cape and hit all the towns up and down during your visit. If you'd rather see the Cape by bike you can pick up the Cape Cod Rail Trail right around the corner from the house. This is truly a home away from home for us! We hope you'll enjoy it too!